UFC 135 is fast approaching, and Fighting Insider just want to know: Who do you think will win on Saturday's showdown? 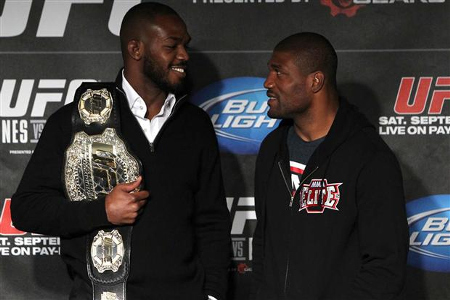 The feud between Jon Jones and Quinton “Rampage” Jackson continues to escalate, heading to Saturday’s UFC 135 showdown. The much-favored Jon Jones will make another example out of Rampage Jackson, while the former light heavyweight title holder will attempt to steal the belt and get the hype out of the 24-year-old king. Can Quinton “Rampage” Jackson knock out Jon Jones? Of course he can, since he has the power and has knocked out some of the notable fighters in MMA. But the question is this: Can he overcome flying knees and spinning elbows, and could he get within reach to drop one of his bombs? Another aspect to consider is diversity. For years, fans have watched Rampage Jackson and noticed that he is a fighter who prefers striking. He may know Jiu-jitsu, Muay Thai and other fighting styles, but does he mixes them up when he’s inside the Octagon? No. That said, his predictability could be his downfall. Thus Fighting Insider would like to know, who do you think will take home the championship belt this Saturday? Drop your picks at the comments.